5G may be the deciding factor between life and death. Shanghai General Hospital and Shanghai Mobile have announced plans to establish a 5G technology-based treatment center. Let’s say, an older man suddenly feels dizzy in a Shanghai stadium. His vital signs are automatically reported to a medical organization and, if necessary, the stadium’s management can locate him and ask for an ambulance to be dispatched. While being transported, the patient’s medical data can be accessed and a real-time video activated through next-generation mobile networks. Surgical facilities can be set up, and the patient’s family is involved online in any decision-making. This is the medical care of the future, as envisioned by Shanghai General Hospital and China Mobile, which recently announced a partnership on the new technology. 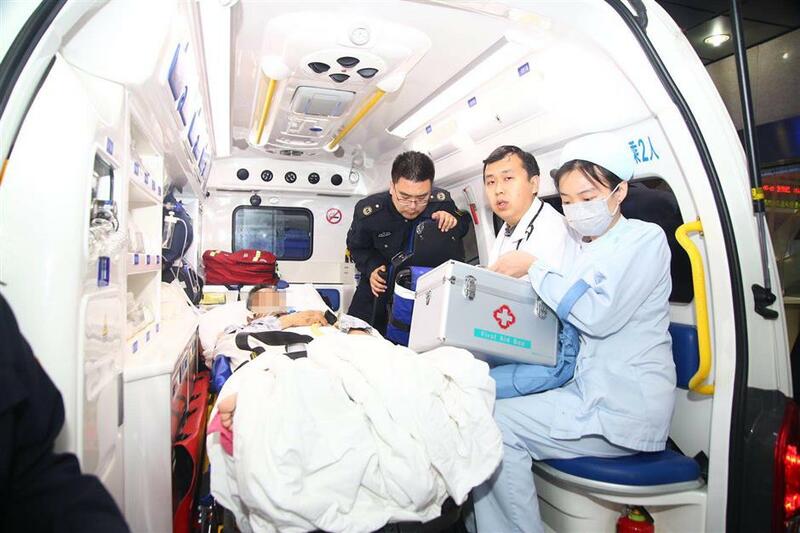 “Patient information transmission and communication betweem ambulance doctor and hospital can be seamlessly conducted on 5G,” said Zheng Xingdong, president of Shanghai General Hospital. China’s first 5G trial was held at the end of last month in Shanghai. It has 1 gigabyte broadband, among the fastest Internet in the world. The next-generation mobile technology offers 20 to 50 times mobile Internet access. Shanghai has accelerated its pace of development and testing of 5G services covering medical, industrial, manufacturing and entertainment applications. According to the hospital and Shanghai Mobile, 5G may be the deciding factor between life and death. The duo has announced plans to establish a 5G technology-based treatment center. The faster connection is “gold time” in emergency medical treatment. For example, a patient’s heart and brain could be forever damaged by more than an 8-minute lapse in treatment of urgent cerebral-cardio vascular diseases like stroke and heart attack. The new technology can greatly improve the efficacy of first aid, in-hospital services and follow-up treatment management. In addition to saving time and providing timely data, 5G also can streamline the use of artificial intelligence and augmented reality technologies in hospitals, the partners said. In a stadium in the Hongkou District last month, Shanghai Vice Mayor Wu Qing made the first 5G video call. The city’s trial is also testing various 5G applications, from industry and sports to those who help government authorities carry out their work. After the trial, the city will roll out 10,000 5G stations in some industrial zones and other trial areas, when China begins issuing 5G licenses. The vastly faster speed it brings is expected to be a dramatic boost for industry and consumers — for everything from health care and manufacturing to smart driving, high-definition streaming and urban management, according to the Shanghai Economic and Informatization Commission. By 2021, Shanghai is forecast to have 30,000 5G stations, with the commission as the local industry regulator. 5G brings a totally new meaning for ultra-high-definition video transmission, with a high speed and mobility features. It brings market opportunities to firms like the Shanghai Uhdvision Technology Co, a local startup producing HD video cameras and related software. The company has upgraded technologies and products to make devices that support 5G networks, said Zhao Weishi, general manager of Uhdvision. Shanghai will support 100 5G-related innovation companies such as Uhdvision to boost the development and ecosystem of the new technology, said the commission. Various 5G applications are being demonstrated in Shanghai, covering electronics manufacturing and urban management. Consumers will one day have access to the network with their current SIM card and number. But they will have to buy new 5G phones, which are expected to stimulate the saturated smartphone market in China. The new 5G medical center will connect 40 hospitals in the Yangtze River Delta for long-distance surgery education services, said the local hospital.